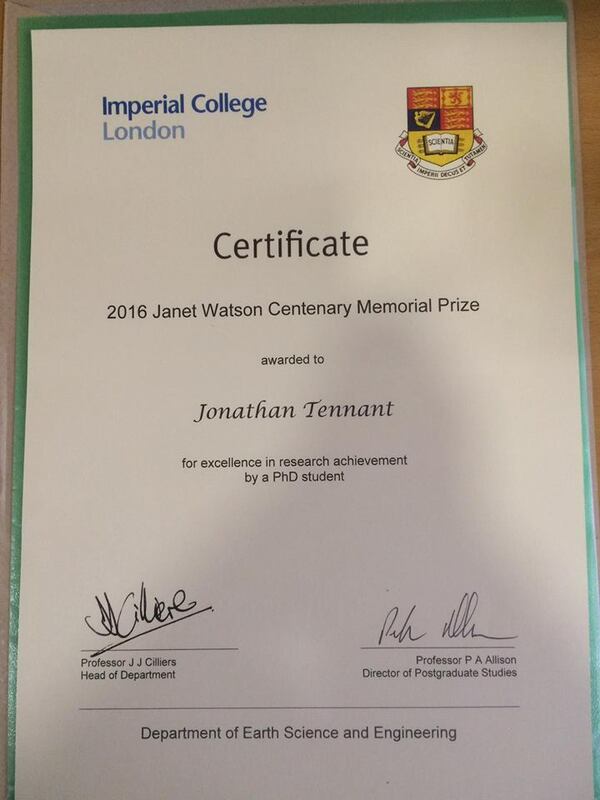 In late 2016, I completed my PhD at Imperial College London, after being awarded the Janet Watson Prize for research excellence. My research was on assessing the extinction status of the Jurassic/Cretaceous boundary, 145 million years ago. My thesis is available here, as well as all publications, which are of course Open Access. I have some advice here via Academia Obscura for people currently doing a PhD, or seriously considering starting one. I don’t want to go into too much detail here, but a PhD is difficult. Like, really difficult. And if you want to stand out, it’s even harder. And if you’re not from a privileged background, it’ll be tougher still. The above achievement, and all the publications and other activities came at a huge personal cost. So I just want to say, if anyone has uncertainties about doing a PhD, what it involves, how to get published, etc., please feel free to contact me. The core of my research involves looking at the interplay of geology, the fossil record, and environmental change. This was to help gain a better understanding of the patterns of biodiversity and extinction we see through time, and which factors controlled them. This involves compensating for the fact that the structure and quality of the fossil record varies greatly through geological history. By compensating for these ‘biases’, we can gain a better understanding of the changing nature of biodiversity for different animal groups through time. This is important as then we can use these baseline biodiversity patterns to gain a deeper understanding of the environmental and biological or ecological factors that have shaped major patterns in biotic evolution. My research focused on tetrapods – animals with four limbs, including mammals, dinosaurs, crocodiles, plesiosaurs, and turtles. What we found is that, over millions of years, changes in sea-level appear to have played an important role in shaping the biodiversity patterns in many different tetrapod groups. 2. The Jurassic/Cretaceous boundary – a hidden mass extinction? My research focused on a specific period in time known as the Jurassic/Cretaceous boundary, around 145 million years ago. Initially regarded as a major extinction, more recent evidence suggests that the story is actually much more complicated (shocker). Around this time, we see the origin of numerous modern animal groups, which suggests that major events were occurring around this time that were important for our understanding of modern animal groups. For background reading, see this review paper. What we think happened is that, instead of a single instantaneous extinction ‘event’, there was a protracted phase of ‘faunal turnover’. This means that numerous smaller groups and species went extinct, but were subsequently replaced by new species who took their place within constantly changing ecosystems. I also study the taxonomy and phylogenetic relationships of the ancestors and relatives of early crocodiles, a group called crocodyliforms. 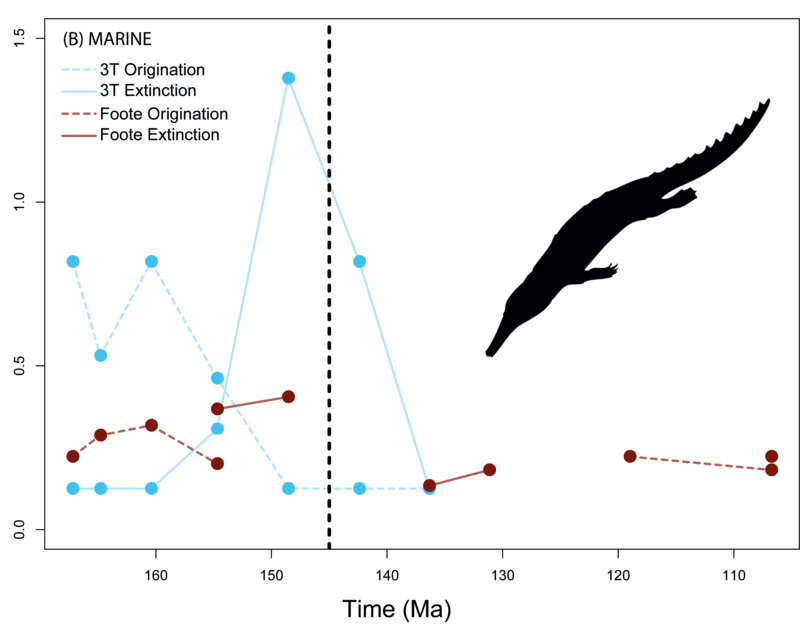 In particular, my work has focused in the evolutionary relationships of a cool but poorly understood group of extinct crocodyliforms known as atoposaurids. These little cuties were common in the Jurassic/Cretaceous transition, and might have been important for the ascent of modern crocodiles. My research led to a taxonomic overhaul of the group, led to the identification of a new species, a new genus, and assisted in the taxonomic identification of several other potentially important specimens in the early evolution of crocodilian ancestors. This provided insight into the evolutionary changes during an important phase in crocodyliform history, the ‘Neosuchia-Eusuchia’ transition. In parallel with my main palaeontological research, I have also led a systematic review on Open Access, which surprisingly is my most highly-cited and re-used peer reviewed paper to date. Go figure. I also led an international project looking at the past, present, and future of peer review, which has been published here. For people who already know some stuff about peer review, skip to Section 4 for our idea of a novel, hybrid peer review and publishing platform, one that would be fit for the digital age. For a comprehensive list of publications, including projects in development, please see here. Please see my Publons record for peer review activities. Please note that I charge a flat fee of £10,000 for each peer review completed (subject to concessions), which publishers agree to upon my acceptance to review for any journal they publish (see here for why).